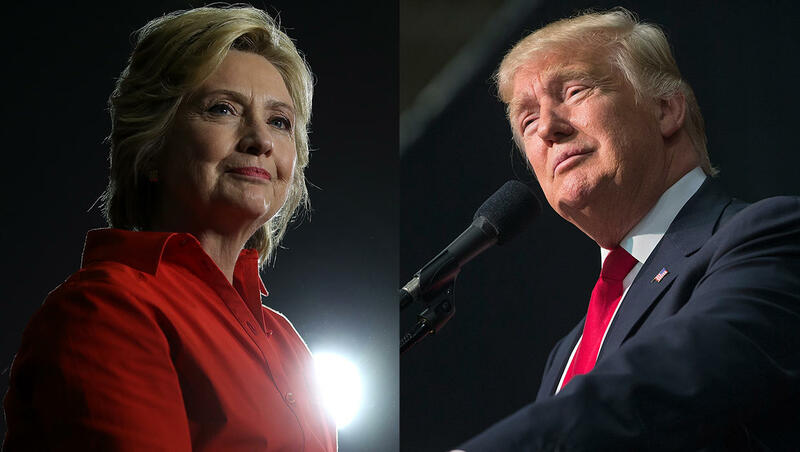 With just one day left in the 2016 presidential race, Hillary Clinton holds a four-point lead over Donald Trump nationally, 45 percent to 41 percent -- similar to last week. Few voters say their minds could change. Trump leads among white men, whites without a college degree, and seniors. Clinton leads among women, African-Americans and younger voters, and she has an edge among whites with a college degree. Clinton voters are more likely to strongly favor their candidate than Trump voters, while Trump voters are slightly more likely than Clinton voters to cast their vote because they dislike the other candidates. On the eve of the 2016 presidential election, Clinton now holds a small lead. In a four-way match-up that includes Libertarian Gary Johnson and Green Party candidate Jill Stein, the CBS News poll finds Clinton holding a four-point lead over Trump. In a two-way match-up that doesn’t explicitly name the third party candidates, Clinton also has a four-point lead over Trump. The vast majority of voters are now firm in their choice: Just 5 percent of likely voters with a candidate choice say they might change their minds. Third party voters are more flexible – about one in five says they could still change their minds – though they make up a very small percentage of voters overall. Most voters still expect Hillary Clinton to emerge victorious on Tuesday, including nine in 10 Clinton voters. Most Trump voters expect their candidate to win, though by a smaller margin than Clinton voters. The demographic profile of the race is virtually unchanged from last week. The gender gap remains: Trump leads among men, while Clinton has a double-digit advantage among women. White voters are backing Trump, particularly white men and whites without a college degree. The race is close among white women, and Clinton has an edge among white college graduates. Clinton has a large lead with African Americans. Similar percentages of the candidates’ own parties are backing them (over 8 in 10), while the race is close among independents. Clinton enjoys a large lead among young voters, but 13 percent say they’ll vote for Gary Johnson or Jill Stein. Trump leads by seven points among seniors. Clinton has the lead among new voters. Twelve percent of likely voters say 2016 is the first year they voted or will vote, either in the primaries or in the upcoming general election. Clinton leads among those voters, while the race is tighter among those who voted before 2016. Donald Trump is leading among voters who made up their minds in the last two weeks, while Clinton leads among those who made their decision earlier. Hillary Clinton has now closed the enthusiasm gap – her voters are now slightly more likely to say they are very enthusiastic about voting than Donald Trump’s voters. This is a shift from last week, when Trump voters had the edge on enthusiasm. Slightly more Trump voters (24 percent) than Clinton voters (20 percent) now say they are supporting Trump because they dislike the other candidates, and more Clinton voters strongly favor their candidate. The closing weeks of the 2016 presidential campaign have seen both major party candidates beset by late-breaking scandals. Most recently, the FBI announced last week that it was renewing its investigation into Hillary Clinton’s emails to see if she improperly handled any classified information. For nearly two-thirds of likely voters, this revelation didn’t make any difference in their vote, though 29 percent said it made them less likely to vote for Clinton. Nearly all the interviews for this poll were conducted before FBI Director James Comey issued a statement Sunday afternoon saying no new actions were warranted against Clinton based on the newly discovered emails. Most voters also say the recent allegations of unwanted sexual contact by a number of women against Trump made no difference, though more than a third say the allegations make them less likely to vote him. This poll was conducted by telephone November- 2-6, 2016 among a random sample of 1,753 adults nationwide, including 1,426 registered voters. Data collection was conducted on behalf of CBS News by SSRS of Media, PA. Phone numbers were dialed from samples of both standard land-line and cell phones. The sample of likely voters is modeled among registered voters (N=1,426), assigning each respondent a probability of voting based on their responses. The margin of error for the sample of likely voters is plus or minus three points. This poll release conforms to the Standards of Disclosure of the National Council on Public Polls.